3" + 5" x 4"
I have been steamboating for quite a number of years. I started with a narrow hull that was over-powered; a metal canopy and supports made the boat rather tender. During a severe storm the boat capsized and left us swimming. Following this disaster I wanted another steam boat but I knew that it had to be one that was stable and roomy. I found, what I thought was an ideal hull being built by an unheard of company down in Rhode Island. After a visit and following extensive discussions it was agree between the owners, Walter and Lloyd Beckmann and I that the hull could be made as a launch and would suit my ideas extremely well. 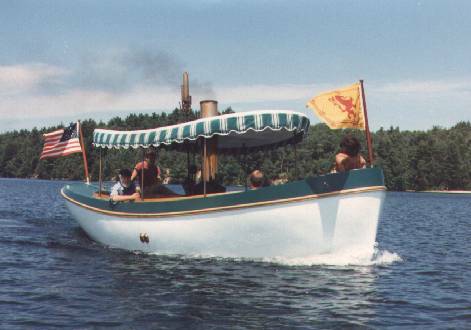 My boat became the first of over a dozen steam launches that the Beckmann's have built using my hull as the prototype (or male mold) for the series. The Mase 22 steam launches as they are now called have proved to be stable and provide plenty of room for passengers and crew, as well a lots of storage space for much needed equipment while cruising such as a grill to broil steaks, boarding ladder for swimming, searchlights for night steaming, bags and bags of wood for extended cruising, and ice chest for cold drinks, as well as many personal items. The boiler in the boat is a VFT-40 vertical fire tube burning solid fuel. It has performed well for over a decade and remains in like-new condition. The engine is a Semple Engine Company compound 3" & 5" x 4" double acting that develops 10 horsepower under a full head of steam. It is quite unnecessary as the boat moves along well on 80 psi of steam and the hull speed of six knots is easily reached. The steam system has been condensing with the condensate water returned to the lake. 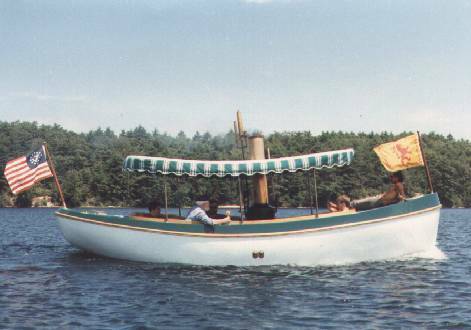 This winter I am having the Beckmann Boatshop modify this so that the condensate can be returned to a hotwell and reused or returned to the lake. This will give me the opportunity to operate in brackish and salt water.